Every 90s kid will remember SM:TV Live – and even if you weren’t a kid, you were probably guilty of watching because it was absolute TV gold! 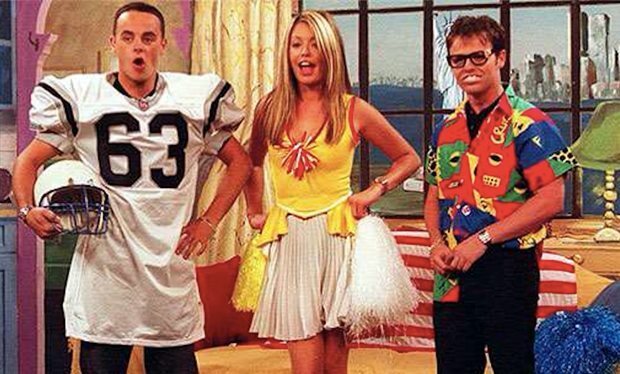 It was a staple part of your Saturday routine watching Ant McPartlin, Declan Donnelly and Cat Deeley in their hilarious sketches, with an array of the biggest celebrity cameos – remember when Mariah Carey was in the Chums sketch? Sorry to make you feel old with my next little line, but can you get your head around the fact it’s been a massive 20 years since the show first aired? Well nearly – SM:TV Live was first shown on ITV on August 29, 1998, and ran for just over five years before its final broadcast on December 27, 2003. Ant and Dec left in order to present another show you may remember – the one which made Will Young famous – remember him – yes Pop Idol! We’ve had first discussions about it and it looks like it’s going to go ahead. Not this September, but August/September next year. We can’t have the same studios unfortunately because it’s all been changed around, but we’ll get the team back together and have a bit of fun. At the time, the duo also promised there’d deffo be a return of Chums, but for what else is in store, we’ll have to wait and see. I know what I’m hoping for though! At the National Television Awards on Tuesday this week, January 23, the nation’s favourite duo confirmed plans were well and truly under way. We can tell you it’s happening, it definitely happening, I’m on board, Dec’s on board, Cat’s on board. A lot of the old team are getting back together. I think we’ve just booked a studio, I think we’ve got some writers involved? So we’re kind of at that stage really. If this isn’t music to your ears and hasn’t made your weekend, then I don’t know what else will? We’re starting to put the little nuts and bolts together. It’s very exciting, it looks like it’ll be probably about September time? What I really hope is that if we do manage to do it and pull it together, I’m really hoping that people have SM:TV parties, and all get together in their pyjamas, and sit and have Bloody Marys and mimosas and full English breakfasts and sit there in their pyjamas and have one huge massive SM:TV pyjama party. Wouldn’t that be brilliant, don’t you think? As long as you can get Spider-Man pyjamas in a big size now.